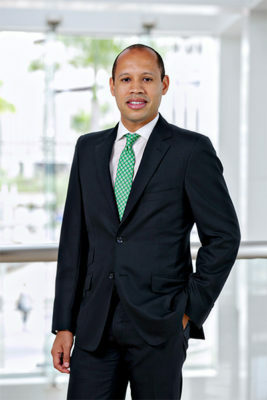 By 2010, after years of legal work in the financial services industry, Jorge A. Rivera had worked his way up the ladder to become senior vice president and deputy general counsel of Popular Inc., the largest financial institution based in Puerto Rico and one of the top fifty bank holding companies in the United States. In this role, he advised the organization on numerous strategic transactions and complex bank regulatory matters. It was the result of a career that he wouldn’t have had without the support of his friends, family, and community at large. In 2016, however, Rivera made a pivotal change. He accepted a role as senior vice president and associate general counsel for Minneapolis-based U.S. Bank. The new role was based in Washington, DC, which meant he and his family would leave their home and community and start again in the nation’s capital. Rivera says the leap was worth it. In his leadership role at U.S. Bank, he builds on his legal experience by serving as an influential advisor and playing a crucial role in the bank’s regulatory strategy. Rivera and his team at U.S. Bank are responsible for providing regulatory guidance and expertise on matters that impact the full range of the bank’s consumer products and services. Rivera also recognizes that there have been other influences that have been key to his success. Rivera’s time in Puerto Rico prepared him well to take on a leadership role in the law division of a major commercial bank. At Popular, Rivera developed a deep skill set in helping organizations and individuals through the challenges associated with less-than-ideal economic conditions. He says that experience helped him better understand the full scope of challenges facing financial institutions. Paired with his intellectual curiosity, that has readied him for his role at U.S. Bank—a role that he was attracted to for a variety of reasons. Because he, himself, has drawn so much from his personal interactions and sense of community, Rivera has been inspired to lead with commitment to the well-being of his team members. He sees having a strong team morale as a top priority because he says that success follows when individuals feel comfortable in the workplace and can truly be themselves. Sullivan & Cromwell is pleased to recognize the accomplishments of Jorge Rivera, a leader in the banking bar and a master of the complex legal and regulatory regime applicable to banks. We are proud to have had the honor of working with him both at Popular, Inc. and at U.S. Bancorp.